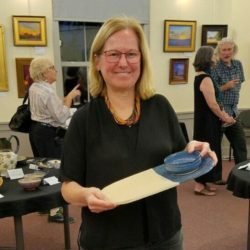 Pam began working with clay over thirty years ago after she graduated from college. First, it was a diversion; a way to meet new friends when she moved from Massachusetts to Michigan to work as an engineer. She returned to the east coast for law school, but continued to make pottery, including spending countless late night hours throwing pots while listening to taped lectures in preparation for taking the Bar Exam. After working in DC as an attorney for 15 years, Pam decided to devote her time to raising her three children. This also permitted her to recommit to her passion for making pottery. Now, she is fortunate to be able to spend many uninterrupted hours working in her home studio. Pam works with high-fire stoneware – either white in color or a shade of tan. She uses a variety of glaze colors, and often combinations of colors so that she can expect the unexpected in each kiln opening. Whether a brie baker, a cheese stome, or a serving bowl, each piece is designed to enhance everyday experiences.